Photoshop, the Darkroom, and "Truth"
In the age of photoshop and other types of image editing software, a lot of time is spent getting to the bottom of images: what is "true" in the things we see, and what is the product of photoshop trickery. Indeed, there are detailed blog posts wholly devoted to setting the record straight about fake viral images and magazine covers. It is seen as a modern phenomenon, where the past is lamented because photos are no longer sacred - their truth and power obscured by modern technology. However, it is important to remember that the history of photography is inseparable from the editing process and technological advancement. In an article from the Paris Review, photographer James Karales said W. Eugene Smith, one of America's most lauded photojournalists, thought 90% of photography was done in the darkroom: "At least fifty percent of the image is done in the darkroom—I think Gene would say ninety percent. The negative has the image, but it can’t produce the image completely, as the photographer saw it—not as Gene saw it. You have to work it over and over with the enlarger, you have to burn it in, you have to hold back areas—this detail down here or over there." Ansel Adams, probably the most well-known American photographer of all time, was famous for his devotion to the darkroom: "Ansel Adams is well known for spending a whole day in the darkroom, just to produce one print. He pioneered the zone system, which we all loosely know today as burning and dodging. He would paint onto the enlarger the areas of the photo he thought should be darker or lighter than others." 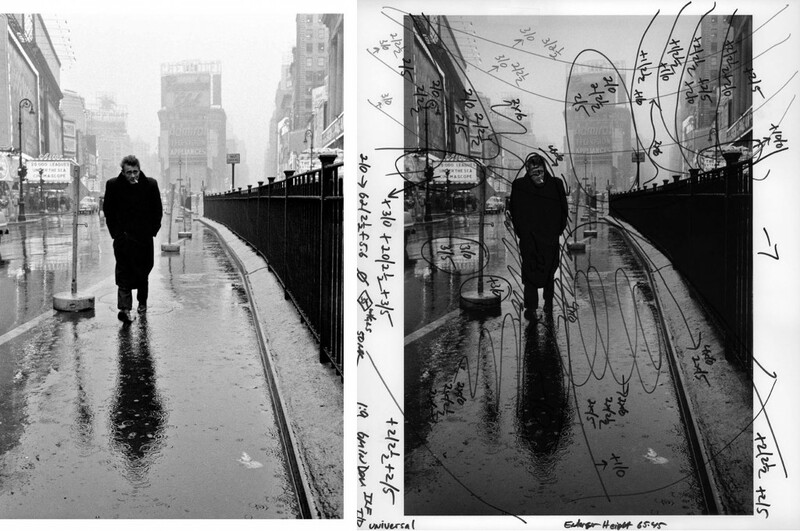 Then there is the 1955 image of James Dean completely covered in scribbles and notes made by Magnum photo printer Pablo Inirio to aid in his post-processing work, showing the extent to which "traditional" photo editing techniques alter the original image. And old darkroom work was not limited to changing elements within a frame, the famous photo from the Vietnam War known as "Napalm Girl" was cropped to tell a different, more streamlined story. To some degree all images are altered, and it is interesting to notice the type of edits which are allowed to enhance a photograph's "truth" value unencumbered by the designation of "trickery," and those edits which are seen to detract from it.